March 27, 2014, 4:19 p.m.
By now most of us don&apos;t need to check under the bed for monsters before we go to sleep, but that doesn&apos;t mean that we&apos;ve grown out of all of our fears. YouGov asked a thousand American adults how much various common fears scare them. Snakes (64%) are the most likely thing to make Americans at least a little afraid, followed up by heights (57%) and public speaking (56%). Just under a third of the country (32%) is &apos;very afraid&apos; of snakes. Americans are least afraid of clowns (13%) and dogs (17%), though 5% of the public do say that clowns make them &apos;very afraid&apos;. Older Americans are significantly more afraid of snakes than younger Americans. 79% of over-65s are scared of snakes, compared to 61% of under-30s. 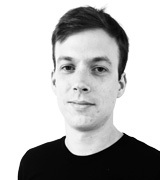 65% of under-30s are scared of spiders, though, while only 49% of over-65s are scared of the eight-legged creatures. 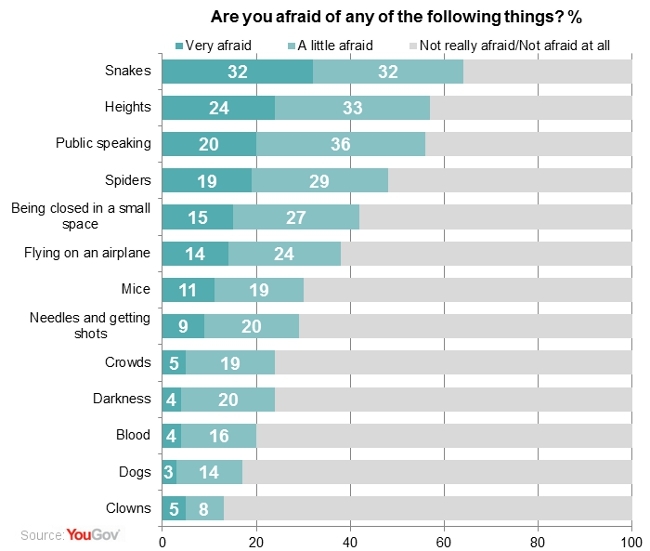 In the UK, the top fears are similar but in a different order: heights (57%), followed by public speaking (56%) and snakes (52%).